A lot of things can happen to your locator when it rides in the back of a truck. Modern electronics make repairing your locating equipment serious business. While most repairs are not difficult, they do require the right tools and expertise. 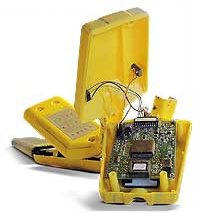 Rycom Instruments'® national repair center are leaders in locator technology and electronics repair. Our 90-day warranty and fast 10 day turnaround will get your locator back in the field making you money. Please fill out a Repair Request Form prior to sending the unit in and please include a copy within the returned unit's box. Obtaining an Return Merchandise Authorization (RMA) is not neccessary as long as a form is submitted. Our professional service staff has some of the most highly trained and qualified technicians in the industry. Unlike many other companies, our service technicians are assigned to specific models, making them more efficient and versed with all the parts and design of that particular unit. They are trained on the field use of the equipment and can answer technical questions with ease. Before shipping, every repaired locator is field inspected by RYCOM's Quality Control Department to ensure it has been properly repaired. Our service staff not only understands locators, they understand locating. If you need custom service, contact one of our sales representatives for help. The length of time it takes to complete a service is variable. Our goal is to provide quality service. We are not done until the job is completed to your satisfaction. The cost of repairs varies depending on the model and type of service. Our customer service department will call or fax you an estimate before we repair your unit. All of our installations come with a minimum one-year parts and labor warranty. Any service repairs we make are guaranteed for a full 90 days. Extended warranties, manufacturer's warranties, inspections and service contracts are all available. Just ask. RYCOM recommends you send your units in annually for calibration. Please contact either of our national repair centers for test and calibration information.